i wouldn't consider myself an artist... in the pen and paper sense anyway. but once in a while, i get really motivated and decide to try my hand at something. this is one of those days! 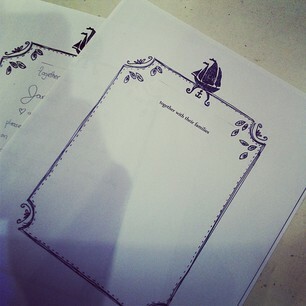 james and i want our wedding invites printed on craft paper, and to have a really rustic feel. then today, i signed onto pinterest and saw an invitation design that i really liked, so i decided to give it my own spin. lots of scanning, re-drawing, cutting and pasting (in a literal sense) resulted! i called up minuteman press in white rock, and explained what i wanted. for a fraction of the price by a typical design company, they are able to print and cut up my design! i am very excited to work it all out and see the finished product!